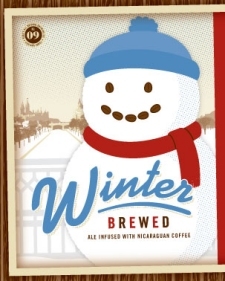 Winterbrewed is an amber ale that has been infused with Nicaraguan Specialty Coffee. It features toasty, biscuity notes from the malt, a herbal, slightly fruity contribution from the hops and strong coffee flavours & pronounced Dutch-processed cocoa aromas from the coffee, grown in Madriz, Nicaragua. Like all our beer, Winterbrewed is organic and Bridgehead coffee is organic and fair trade. Winterbrewed Amber Ale will be officially released on February 10th, with tastings planned at the brewery on February 12th, and at Bridgehead (96 Sparks Street, Ottawa) on February 19th. The release will be limited to 1000 bomber bottles. Also, in a recent appearance on A Morning, the morning show on A Television in Ottawa, Beau’s owner Steve Beauchesne noted that starting with the upcoming release of their spring seasonal, Beaver River IPA, all of Beau’s seasonal beers – including Festivale (summer), Night-Märzen (fall) and Bog Water (winter) – will be available at select LCBO outlets, alongside the flagship year-round brew Lug-Tread Lagered Ale.